You’ve probably heard that breakfast is the most important meal of the day. Regardless of age, everyone needs to eat something nutritious and energetic to start the day in the best possible way. Even better if it is also delicious! 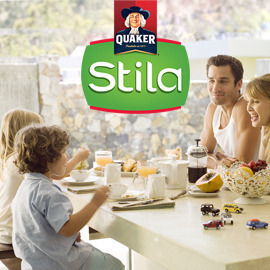 Can you create an innovative idea for a healthy, energetic and delicious ready-to-eat product for Quaker and Stila that you can have for breakfast? Come up with ideas for the next generation of healthy and ready-to-eat breakfast products for Quaker and Stila through text and illustrations! Help us get new ideas on how these breakfast products can be surprisingly great for you and will make you start your day in the best possible way. Submit your entry before January 28 and win up to €5.500!